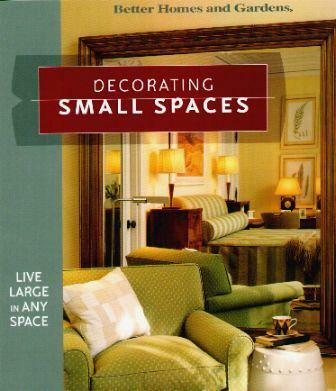 This is a charming book just full of wonderful ideas for decorating small spaces in your home. I always find it difficult to visualize change, especially in a restricted area, so this beautifully illustrated and everything-thought-out-for-you book, is perfect. Whether it's a corner in a room, a tiny bathroom, a little bedroom, a small living room, or space under the stairs, they've tackled and conquered them all. Not all decorations are flowery or colorful, some are traditional, arty or simple yet elegant. I love that there are no rules anymore, well, not strictly speaking, so there are many more ideas that were once no-nos. For example, painting the walls of a small room in a dark color. I'm not very good (creative) when it comes to decorating so I rely heavily on other people's ideas. Here they've maximized space, brought in light from existing windows, and set about making every room they work in, just spectacular. If you don't agree you're sure to find many ideas that you can adapt to suit your personal style. Unfortunately most of us have too much "stuff" but in this book you'll find many practical and appealing solutions. I loved the kitchens and I think the portable closet on page 59 is a wonderful idea, as well as the ornament and floral touches, despite my fear. Oh, how can I pursuade this extremely talented decorating team to come and give me a helping hand? Conclusion - An asset to anyone who likes changing or updating their home. There isn't much, perhaps the cluttered rooms, that I couldn't see myself happy with.